The Prior Scientific motorised shuttle stage is designed to be used for wafer inspection, using either Nikon or Olympus wafer handling systems. The stage greatly reduces operator error and fatigue, whilst increasing the rate at which wafers are inspected. The H116SPN automatically loads and unloads wafers. When operating, the shuttle system automatically moves to the correct load position and activates the loader switch, notifying the loader that the wafer chuck is ready to receive the wafer. After transfer to the shuttle, the shuttle is retracted, allowing inspection. The stage allows either manual inspection using a joystick, or a pre-programmed pattern for wholly automated inspection. The H116 SPN has a large travel range, coupled with superb repeatability and resolution and, used in conjunction with Prior’s ProScan® III system, ensures accuracy, precision, minimal error and ultimately a far more effective wafer inspection process. 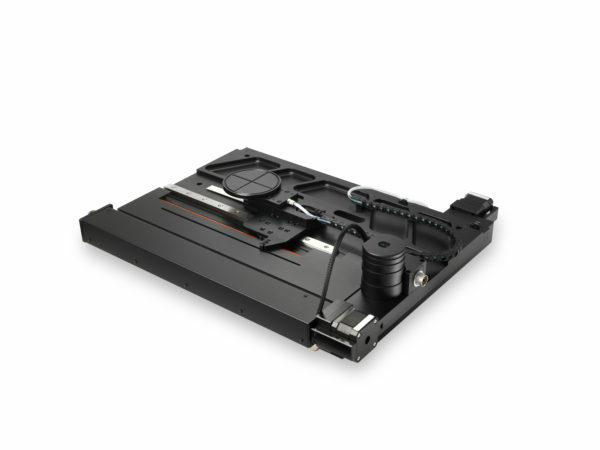 • Compatible with the ProScan III system , as well as Nikon and Olympus wafer handling systems.